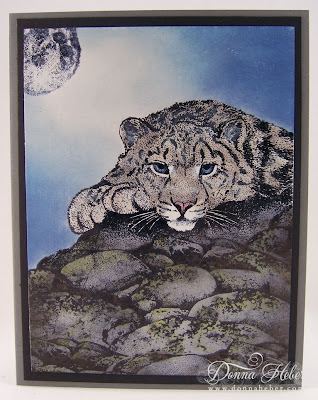 My project today is a Stampscapes scene using the Snow Leopard stamp by Coronado Island. They have some wonderful images, which I purchased almost a year ago and I'm trying to ink up all my rubber. This is a birthday card for a male friend. On a piece of glossy paper, I stamped the Boulders with Lichen several times in StazOn Black using a Stamp-A-Ma-Jig for placement. I then positioned the Snow Leopard and moon also stamping them in StazOn Black. The sky was sponged in Bordering Blue, Ballet Blue, Brocade Blue and Night of Navy. 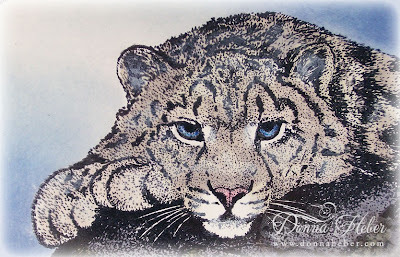 The leopard was colored with Sahara Sand and Distressed Pumice Stone. I colored the nose with a Pretty in Pink marker. The eyes were done with a Ballet Blue marker then added a sky blue Spica pen with Crystal Effects. Rocks were sponged in Basic Gray, Distressed Forest Moss and Distressed Black Soot. To soften the leopard's face and ears I applied ColorBox Frost White. 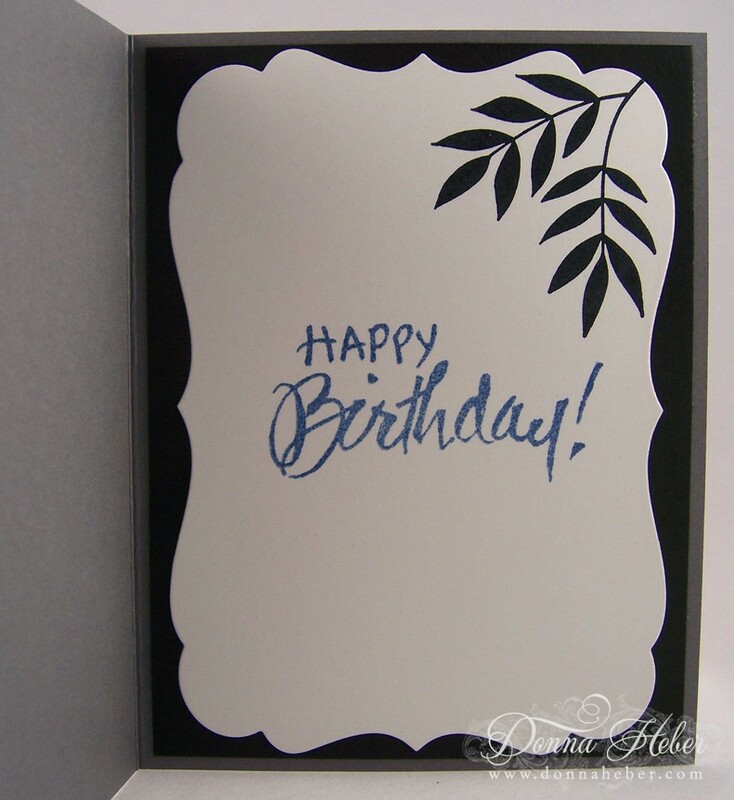 I adhered the image to a piece of Basic Black and mounted it onto a pewter gray card. 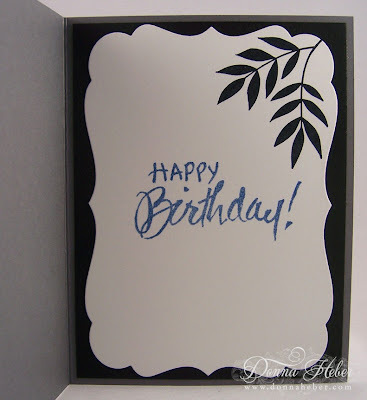 Using my Big Shot I cut a piece of Whisper White paper using a Spellbinders Labels Seventeen #6 die. The inside sentiment was inked in VersaMark then Brocade Blue and embossed with clear embossing powder and a heat gun. The twisting leaves were stamped in StazOn Black. Love seeing your creations and reading the 'how you made the card' descriptions. Wow, you've brought this cat to life! I like the mossy rocks too. Love how you put this all together. The moss on the rocks is a great detail! wowwwwwwwwwwwwwwwwww what a gorgeous stamp and card donna. you have stamped this beautifully. thank you for all the lovely and sweet comments. Wow! What an absolutely beautiful "male" card. As the recipient of this card, I was in awe when I first saw it. I currently have it on display at my desk at work and have received numerous comments on it. I'm a big fan of Donna's Stampcape creations. Thanks for everything Donna!! This is stunning! That cat is gorgeous. Thanks for stopping by my blog and you nice comment. You make beautiful cards. The leopard is fantastic! really great card Donna. Love the coronado island stamps. Of course I just love this card!! I love all of your scenic cards. The colors just make it so realistic. Fantastic job!